THEY HAVE NAMES is part of a larger program, An Arts Program on the Human Impact of the Syrian Conflict, presented by Gallery Al-Quds in cooperation with the Goethe-Institut and the Middle East Institute’s Arts and Culture Program. Daniel’s work will be shown at Goethe-Institut alongside pieces of fellow artist Kai Weidenhöfer, whose exhibition, FORTY out of ONE MILLION, opens at Gallery Al-Quds on April 21, which will also feature pieces of Daniel’s work. His career as a photographer and videographer began in 2007, primarily shooting commercials for big brand companies, as well as actor portraits. In 2015, Sonnentag began volunteering at the ICC Berlin refugee camp, where he first met the subjects of his recent photography. Since his initial encounters with the children there, he has become a regular force in the camp, accompanying the kids on excursions, teaching kick boxing, and providing a strong “fatherly” figure for many. These experiences influenced his decision to focus his photographic work on the social issues of integration of immigrants and the communication between people of different cultural and religious backgrounds. The social media campaign, THEY HAVE NAMES, sprouted out of this work. 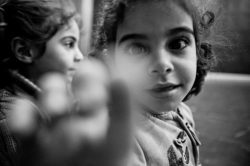 In his exhibition of photographs at Gallery Al-Quds, Daniel’s THEY HAVE NAMES project helps the viewer see the “kids,” as he calls them, as the children they are, first and foremost,and helps people to see behind the ”refugee,“ the “war survivor“ and recognize the similarities to their own children. Helen currently lives and works in Washington, DC, as an artist. She paints primarily in gouache and ink on board and canvas. More recently, she has worked with wood, shoes, cloth in mixed media installations. Her work has been widely exhibited in galleries and museums in the United States, Europe and Lebanon. Her paintings are included in many private and public collections, including the White House, World Bank, Library of Congress, US Consulate General, Vancouver, Canada, American Embassy in Baghdad, Iraq, the Arab American National Museum in, Michigan She was awarded the Artist Fellowship grant from the DC Commission on the Arts and Humanities in 2015 and 2016, and is included in the new Washingtonian Collection, and DC Art Bank. Helen was also invited as artist in residence at both George Mason University in 2015, creating a silkscreen with Navigation Press and Wesley Theological Seminary in 2016. Her paintings have been included in several Art in Embassy exhibitions abroad, including Brunei, Nicaragua, Mauritius, Iraq, Belgium and Lebanon. In 2008, Helen was invited as US Cultural Envoy through the US Department of State, to Palestine. In 2009, she was invited to Switzerland and France, under the US Department of State’s Speaker and Specialist Program. In October 2016, she traveled to Saudi Arabia as US Cultural Envoy, speaking to young Saudi women artists. Her paintings have been gifted to heads of state by President Obama and former Secretary of State, Hillary Clinton.